The panelists of "An Evening with Trailblazers — Are We Going To Mars?" at Rensselaer Polytechnic Institute (RPI) on Sept. 26, 2018. 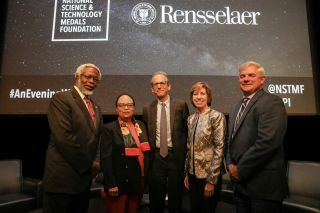 From left to right: theoretical physicist Sylvester James Gates Jr.; RPI President Shirley Ann Jackson, moderator and WMHT President Robert Altman; Ellen Ochoa, former director of NASA's Johnson Space Center; and Space Foundation CEO Thomas E. Zelibor. A monthslong journey. Docking on a faraway moon. What scenarios would make a human voyage to Mars possible? In late September, four experts participated in an hourlong conversation about what a mission to Mars would actually look like. "An Evening with Trailblazers — Are We Going to Mars?" took place at the Rensselaer Polytechnic Institute in Troy, New York, on Sept. 26. A student asks a question at the end of the panel, "An Evening with Trailblazers — Are We Going To Mars?" at Rensselaer Polytechnic Institute on Sept. 26, 2018. Ellen Ochoa, former space shuttle astronaut and previous director of NASA's Johnson Space Center, explained some challenges in designing a voyage to Mars. "We've looked at a variety of different things," Ochoa said. "And one of the things that you have to grapple with immediately is … there're really only kind of two choices: You're there [on Mars] for a couple of weeks, or you're there for almost a year." Ochoa said the short-mission option might involve orbiting the planet or landing on one of Mars' low-gravity moons, where the crew might attempt to send robots to work on the planet's surface before attempting a human landing. And a longer mission might involve bringing humans to Mars' surface and performing a closer analysis of the Red Planet's regolith, or dust, to perhaps learn if it could be turned into a propellant, she added. Former astronaut and former director of NASA's Johnson Space Center, Ellen Ochoa, addresses a question at the event "An Evening with Trailblazers — Are We Going To Mars?" at Rensselaer Polytechnic Institute on Sept. 26, 2018. Ochoa also detailed the challenge of combating harmful radiation: "The problem with the radiation, the galactic cosmic rays, is that you're getting this constant dose the entire time," she said. Radiation may increase a crew's risk for cancer and alter their cognitive ability, according to Ochoa. To help deal with this problem, researchers could focus on designing a magnetic shield to protect passengers and learning how genetic factors play a role in susceptibility to radiation. Shirley Ann Jackson, a theoretical physicist and president of Rensselaer Polytechnic Institute, affirmed during the panel discussion that these are all possible hazards. "But in many ways the real challenge, from a technological point of view, is that they are really intersecting challenges and vulnerabilities" that could be treated by looking into the research of other disciplines. "But therein lies opportunity," she said. Jackson proposed that mission team designers might learn by observing fields of science such as biology and oncology to develop deep-space spaceflight materials. A photo of the panelists and the student crowd at "An Evening with Trailblazers — Are We Going To Mars? at Rensselaer Polytechnic Institute on Sept. 26, 2018. "Right now, there's plenty of competition going on," Thomas E. Zelibor said during the event. He is the CEO of the Space Foundation, a nonprofit organization that advocates for space activities. "If you look at the commercial enterprises that are launching into space versus, as I call them, the industrial military complex, [or] traditional people that we think of, there's a tremendous competition going on. But I think they're going to be forced into a cooperative environment," Zelibor said. Otherwise, he said, "there's just not enough money to do it." NASA has moved in the direction of private company partnerships over the last 10 years, according to Ochoa. "We [at NASA] really changed our model in terms of how we work with companies... we are now buying services; we don't own the spacecraft," Ochoa said. Companies now have more decision-making power about how they will meet spaceflight requirements, she added. Ochoa said companies are free to look for other customers, too. "NASA's still clearly the anchor customer for human space exploration... there's really no other big customer out there, but there's the hope that it will grow," Ochoa said. "So, we've really changed the model of how we work." A full recording of the event, called "An Evening with Trailblazers — Are We Going To Mars?" is accessible here.